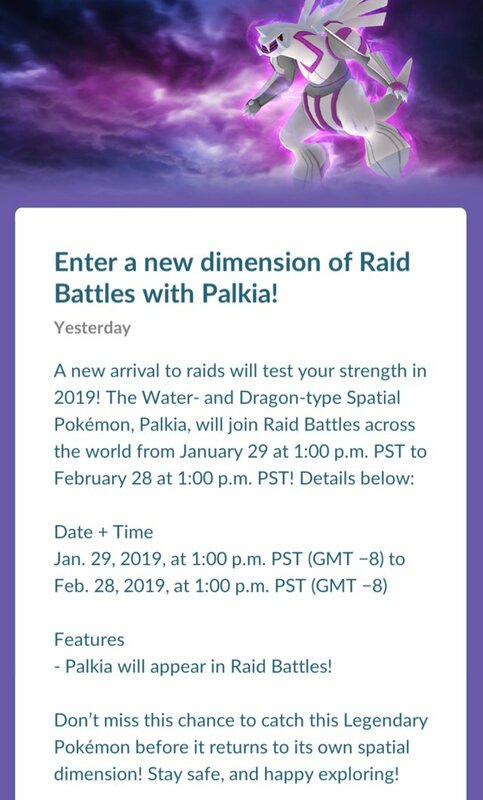 Pokemon Go: New Raid Boss Palkia Available Now! Niantic recently released an all new Legendary Pokemon for Raid battles! The latest Legendary Raid boss is the Generation Four called Palkia. Palkia is a Water and Dragon type Pokemon. I have to admit that the Pokemon is one of the coolest looking in my opinion. It could be due to the fact that it is considered one of the Spatial Pokemon of the series. I have had the chance to battle a couple of these and have to say that it has been somewhat refreshing to see more of a challenge to defeat and catch these. In the past most legendary raid bosses could be defeated with as little as 3 normal trainers. But this one seems to has some good stats that make it necessary to have at least 5 trainers battling it. It is a similar type to one of my favorite Pokemon to use, Dragonite which is also Water and Dragon. Actually, Dragonite is actually the best counter for the new the Raid Boss. Despite the multiple Raid battles I have done, I have only been able to capture one of these despite the attempts so it feels kind of unique to me. Although I have not used it yet in battles, it seems like a good Pokemon to have as an option for battles. It is always good to get another addition to the Pokedex!